During the Progressive Era, women in the Bethel congregation formed the Daughters of Bethel Benevolent Society, which W.E.B. DuBois cited as a forerunner in mutual aid. The church was active during the Civil Rights Movement, hosting a weekly radio broadcast and providing space for civil rights rallies. Dr. Martin Luther King, Jr. appeared at Big Bethel for a National Association for the Advancement of Colored People (NAACP) rally shortly after the Montgomery Bus Boycott of 1957. During the 1970s, Big Bethel opened its own low-income housing complex. The arts have also been a source of recognition for Big Bethel. The church is known internationally for its play “Heaven Bound,” which has been performed there since 1930. Bethel choirs performed at the world premiere of Gone with the Wind and for President Franklin D. Roosevelt when he visited Warm Springs, Georgia. Bethel A.M.E. has hosted a number of notable speakers, including Booker T. Washington, President William Howard Taft, Mary McLeod Bethune, Dr. Martin Luther King, Jr., President Jimmy Carter, Nelson Mandela, and President Bill Clinton. 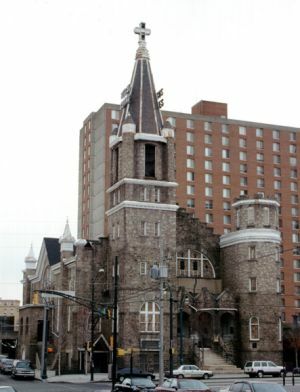 Big Bethel, located at 220 Auburn Avenue, continues to be an active force in trying to restore a once economically vibrant street, and Atlanta’s Sweet Auburn Historic District, even purchasing and holding land to spur redevelopment. Big Bethel AME Church Website; Love Henry Whelchel, Sherman’s March and the Emergence of the Independent Black Church Movement (New York: Palgrave Macmillan, 2014); Tera W. Hunter, To ‘Joy My Freedom: Southern Black Women’s Lives and Labors After the Civil War (Cambridge, MA: Harvard University Press, 1997). MA: Harvard University Press, 1997).